Red Ledges in Utah has everything you'd want in a luxury housing community: great views, miles of infrastructure and, most importantly, a Jack Nicklaus Signature Golf Course. HEBER CITY, Utah - If you were going to develop a luxury housing and recreation community in these economic times, you might have a wish-list something like this: two Fortune 500 CEOs for owners, over 2,000 acres of land in some of the most pristine country in America, and nearly 10 miles of infrastructure and utilities installed even before the first house was built. 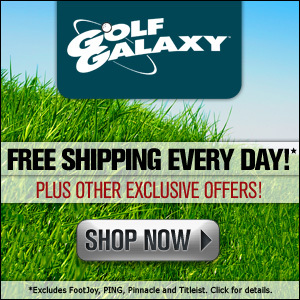 Most of all, though, you might wish for a centerpiece golf course, designed by the greatest player in history. After touring the grounds of Red Ledges, about one hour north of Salt Lake City, you start to wonder if maybe the developers of this exclusive four-season community have a genie corked in a bottle somewhere. It's hard to imagine anything else they could wish for to make the place any better, and that goes for the superb Jack Nicklaus Signature Course that lies at the heart of the development. 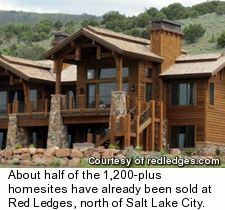 Although about half of the 1,200-plus homesites at Red Ledges have already been sold; as of yet, most of the amenities (and all of the homes) are still nascent. The list of what is yet to come, however, is nevertheless almost overwhelming. Within the next couple of years, residents will have access to a nine-hole Jack Nicklaus short course, Jim McLean Practice and Instructional Facility, Cliff Drysdale Tennis Academy, spa, swimming pools, fitness facility, equestrian center abutting over 3,000 contiguous acres of open space, hiking, biking and horseback riding trails, breathtaking mountain views, close access to Deer Valley Resort ski areas and excellent fly fishing in several rivers nearby rivers. The one amenity that is already open, however, is quite a doozy: the Jack Nicklaus Signature Golf Course. Visitors and prospective homeowners fortunate enough to play this masterpiece will never forget the experience, and as such, it would be hard to imagine a better way to advertise the Red Ledges community. 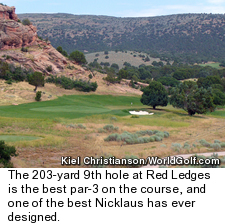 Red Ledges is the 200th U.S. course by Nicklaus Design, and the Golden Bear brings all of his copious experience to bear on a truly spectacular and challenging site. The titanic track measures 7,653 yards from the tips, with a stratospheric course rating of 77.2 and slope rating of 153 from the tips. Fortunately for us mere mortals, however, every hole offers four or five tee boxes, and from the 5,190 forward tees, this bear plays more like a frisky cub. No matter where golfers tee it up, though, everyone gets to play an amazing routing that begins atop the namesake red ledges - cathedral sandstone cliffs that tower above the winding, heaving fairways. The tees of the 427-yard first hole are perched some 300 feet above the first fairway. This is one opening hole that you will never, ever forget. 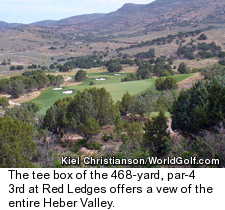 Another tee box that will have you licking your chops is at the 560-yard 14th, where you stand more than 150 feet above the fairway with another view of the entire valley and the surrounding mountains. As with most of the holes, there's a generous fairway but deadly trouble right and left, especially if you hit it like a golf writer. Perhaps my favorite hole on the entire course, though - and one of my favorite all-time par 3s - is the 203-yard ninth. Even if you are playing the member tees (168 yards) or middle tees (147 yards), consider moving back to the Nicklaus tees here. Climbing the steps to the summit of a tee box reminiscent of a Mayan pyramid, you shoot over two juniper trees to a semi-occluded, semi-bowl-shaped green that runs from front left to back right. To be completely honest, I have never quite understood the allure of private golf courses. Red Ledges, however, has opened my eyes. As a private course, though, where the members will have unlimited access, world-class instruction and immaculate grooming, Red Ledges is ideal. The sprawling, rolling greens are extremely tricky, and although they are still young and quite grainy, they will in time become legendary. Approach shots simply must find the right sections, or three- and even four-putts will spoil some otherwise good rounds. The same can be said of the fairways, where position and club choice will be crucial, especially at this higher altitude (where every shot seems to travel about a half club too far). Although the clubhouse is not built yet, it will someday loom above the first tees, atop the red ledge itself and will offer one of the most spectacular views in a state full of amazing landscapes. For now, the temporary clubhouse/half-way house is as comfy as some real clubhouses and serves up perhaps the best hamburger I have ever tasted. In short, Red Ledges is a true members' course for some very, very fortunate members. 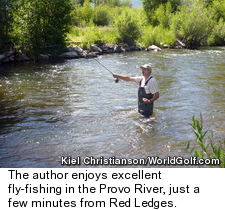 For more information, visit www.redledges.com. Any opinions expressed above are those of the writer and do not necessarily represent the views of the management. The information in this story was accurate at the time of publication. All contact information, directions and prices should be confirmed directly with the golf course or resort before making reservations and/or travel plans.